I spotted this photo on Tim Jackson’s blog (he works marketing for Masi). This is a mini velo-style bicycle meant for the Japanese market. Mini velo can describe any bike with small wheels (generally 20” or smaller) including folding bikes, but there is a subset that resemble road bikes with tiny wheels. It’s like a Smartcar for cramped city riding….doesn’t take much space to park either. Mini velos are popular in Japan, but as of yet no one sells them in the states. 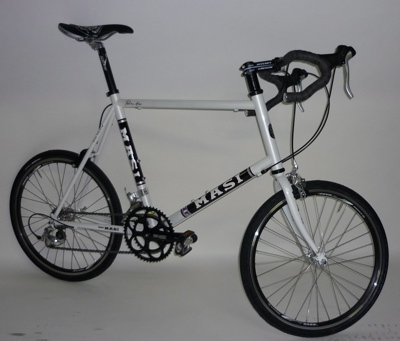 The Masi seen here is a pre-production prototype. This is an important step for large companies because it is their last chance to notify overseas factories if changes need to made to the design. Small things like eyelet placement, paint and decal issues, etc. Mini velo bikes are reasonably priced in the Japanese market, but short of actually going to Japan and buying one, you can’t get them here in the states. That may change eventually, but I haven’t heard of anyone planning to sell them for 2009. I swear, the next time I go to Japan, I’m coming back with one.